KT 17 Rebuild includes: One Complete gasket set with oil seals Two sets of standard rings 2 sets of standard rings (3.125 inches), Please note it is very common that ring end gap may need to be set. This gets you maximum performance and end gap filing may need done. Two Standard Connecting rods and I do also have rods in. 010 but this is for standard. This kit is for all KT17engines, such as KT17A, KT17S, KT17AS, KT17AQS and so on no matter what the suffix is. 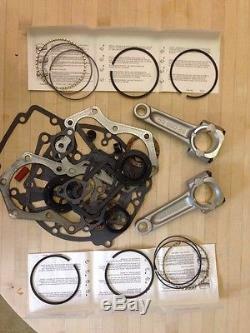 The item "Kohler Kt17 engine rebuild kit, Gasket set, std rings, standard rods" is in sale since Friday, June 20, 2014. This item is in the category "Home & Garden\Yard, Garden & Outdoor Living\Lawn Mowers\Lawn Mower Parts & Accessories". The seller is "bakt4kids" and is located in Wauseon, Ohio. This item can be shipped worldwide.